On June 20, 1989, Shanghai sentenced three people to death for participating in riots. The White House announced its suspension of all high-level Sino-US official contacts. Yet on the same day, President Bush wrote a secret letter to Deng Xiaoping in order to preserve the relationship. On June 14, 1989, under the intense pressure of the Most Wanted, Zhou Fengsuo was arrested at his home, reportedly turned in by his own sister. (Zhou Fengsuo later claims that his sister had been deceived.) Xiong Yan was caught in a train. Ma Shaofang and Xiong Wei chose to turn themselves in separately. Also arrested on this day were Dai Qing and Gao Xin. More Most Wanted were published, this time include leaders of the Workers Autonomous Federation Han Dongfang, He Lili, and Liu Qiang. On June 11, 1989, Beijing Public Security Bureau officially published the Most Wanted notice on Fang Lizhi and Li Shuxian. The two of them had already taken refuge in the American embassy at the time. Zhou Yongjun, on the other hand, chose to turn himself in on this day. Also arrested on this day is a man by the name of Xiao Bin. On June 4, he was caught on the camera of American TV news exaggerating the scenes of the massacre. He was later sentenced to 10 years prison term. In Paris, 17-year-old American Chinese tennis player Michael Chang won the French Open. He spoke on God bless Chinese people. 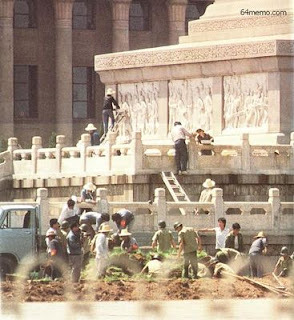 On June 9, 1989, Deng Xiaoping finally appeared in public after the massacre by meeting with a large assemble of officers of martial law troops. He was accompanied by Yang Shangkun, Li Peng, Qiao Shi, Yao Yilin, Wan Li, etc. -- an early indication of who among the top leaders had gained the upper hand. Deng Xiaoping delivered a lengthy speech to establish the official party line on the massacre. Also on this day, the city of Shanghai mobilized a hundred thousand workers to clear obstacles in her streets. Normal order gradually returned to the city.